Impressive luxury holiday home with a magnificent infinity pool overlooking the sea and the Portichol islands at Javea. Sleeping up to seven people the villa Jansen is just a short drive from the Barraca beach and one of the Costa Blanca's best family resorts. Alicante Airport 111km and Valencia airport 123km. Villa accommodation covering 300 m² on three floors for 6/7 people, 4 bedrooms, 4 bathrooms, air conditioning, satellite television, the internet, (private tennis court for a supplement). The upper floor has an air conditioned master bedroom (2 x 90 cm wide beds pushed together) with a beautiful bathroom and private terrace. The main floor has an air conditioned living and dining room with large patio windows offering superb sea views, equipped with a fireplace, the internet, satellite television and CD player. Spacious, modern, fully equipped kitchen with dishwasher, microwave and all you need for self-catering, opening onto the terrace. Study and a shower room with toilet. The lower floor has an air conditioned bedroom (2 x 90 cm wide beds pushed together) and a bathroom with toilet. Further air conditioned double bedroom. Shower room with toilet. Small single bedroom. The interior is very tasteful and comfortable with a nice mix of contemporary and modern style furnishings, all very refined. By the pool, there is a small laundry room with washing machine and dryer. The garden has a superb terrace and a huge, really beautiful main pool (10m x 5 m and 1.5 m to 2 m deep) joined to a children's pool (4m x 3 m and 1m to 1.5 m deep) and divided by a low wall, both have an overflow effect. Palm trees add an exotic touch and there is plenty of garden furniture so you can dine in the shade of the covered terrace or recline in the sun. Barbeque for grills. Closed garage. There is a private tennis court available for your unique use, 3 minutes walk from the villa, for a supplement of 100€ per week. It needs to be reserved in advance. Service of a chef can also be arranged on request for a supplement. Our view; a truly extraordinary villa. Sandy Arenal beach 4 km. Barraca pebble beach 1.6 km. Javea old village and port 7 km. Shops 3 km. 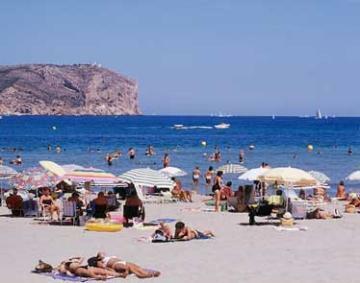 In Javea, you will find smart bars and many excellent international restaurants, chic boutiques as well as authentic Spanish tapas bars. The huge, main Arenal beach has soft sand and slopes gently into the warm sea. By the pretty port you can eat out on fish caught fresh the same day. Our multi-lingual local staff can help you book a restaurant or even organise a boat with a skipper for the day. NOTE: 30% deposit required to secure reservations for this property. The map below shows the approximate general location of the property. Property made available in good order and fully equipped. Local taxes, reasonable consumption of services including water, gas and electricity. Garden and swimming pool maintenance. Change-over day is Saturday, arrival time 16.00 to 19.00, departure before 10.00. Bed linen and towels, air conditioning and final clean. A deposit of 500 euros in cash must be deposited when entering the premises. The rental of the tennis court: 100 euros per week.